Today we demonstrate the technical conditions that, when met, have provided a strong bullish trigger for AMD. There is a technical set up such that it triggers bullish times to trade Advanced Micro Devices, even in a bear market, that has shown triple digit returns through 2018, and quadruple digit returns (1593%) over the last three-years. 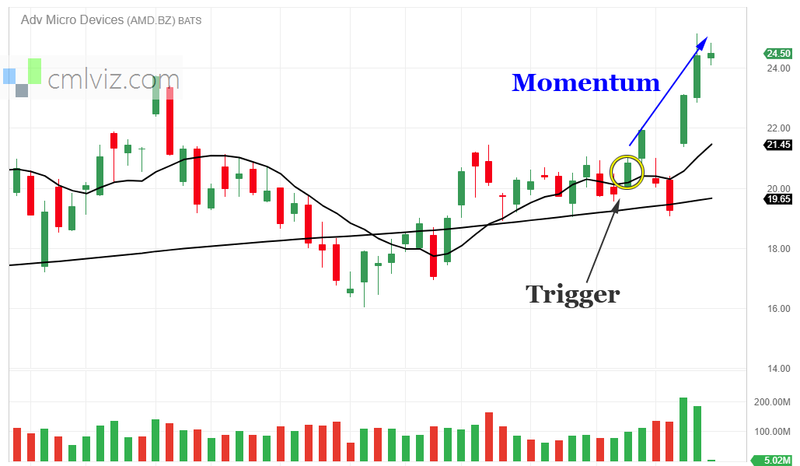 * Use a technical trigger to start the trade, if and only if these specific items are met. As of this writing, 1-31-2019, the conditions are not yet satisfied. * Use a 20% limit and a 40% stop. At the end of each day, the back-tester checks to see if the long call is up 20% or down 40%. If it is, it closes the position. Here are the results over the last three-years in Advanced Micro Devices. You can see the exact set-up to replicate it in Trade Machine by tapping this link. ➡ The average percent return per trade was 33.8%. ➡ The average percent return per winning trade was 68.8%. ➡ The average percent return per losing trade was -48.6%. Why Are the Averages Different Than the Stops and Limits? First, the backtester uses end of data to maintain a strict structured rule based system. So the stops and limits won't be exact. You can check moving averages for AMD on the Pivot Points tab on www.CMLviz.com.